Did you know that the Yorkshire Terrier comes from rural Yorkshire in quaint little England? Because Yorkshire Terriers bark a lot, they make great little guard dogs for your home. 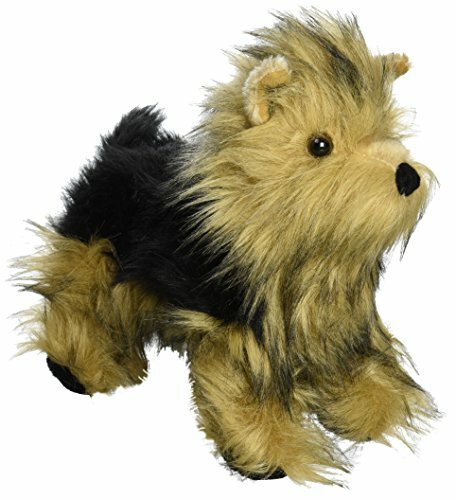 If you prefer the silent variety then a Plush Stuffed Yorkie would work much better. There are plenty of sweet plush Yorkshire Terrier toys on this page for you to browse with a view to adopting one. My favorite is the Russ Berrie Yorkie because it is a realistic looking long-haired soft toy with an adorable red ribbon bow. 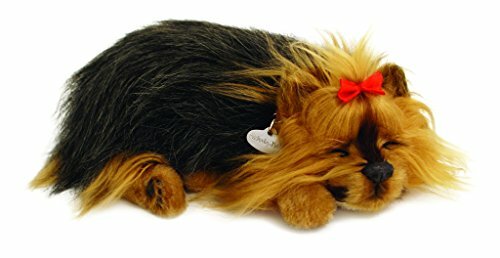 This short hair, stuffed Yorkshire Terrier dog toy is the most realistic and life-like Yorkie I've come across. He's an absolute little darling! Customers have actually purchased these for kids who want a real Yorkshire Terrier dog but can't have one. This gorgeous plush gives a child the next best thing and needs no cleaning, walking, feeding, grooming or expensive vet bills! 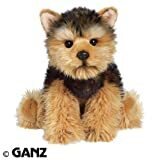 Yorkie here is part of the Webkinz Signature series which is a superior line of plush toys. Add to that the fact that with every Webkinz toy you get a special code so kids can also play with their new plush pet online. This makes this particular stuffed Yorkshire Terrier a great choice. This little chap's laying down and peeping at you from under his long facial hair. He comes with a cool haircut which means he has short hair along his body and long hair around his face. 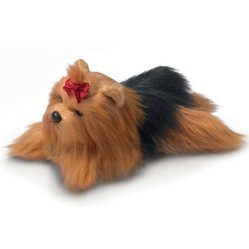 This stuffed Yorkshire Terrier comes with a cute red bow too. He's small and gorgeous. If you had a real Yorkie with hair this long, he'd need to have it brushed on a daily basis to keep it looking good, a weekly shampoo and condition and regular trimming to get rid of split ends. Know a little girl who loves pink, Yorkshire Terriers and hair styling? Then here's the ideal gift. This ribbon Yorkie is a pink bubblegum puffball of fun. She's fluffy, soft and fun to play with. Kids can gently brush her long pink fur and braid it along with the pretty, pastel ribbons which are attached to her. 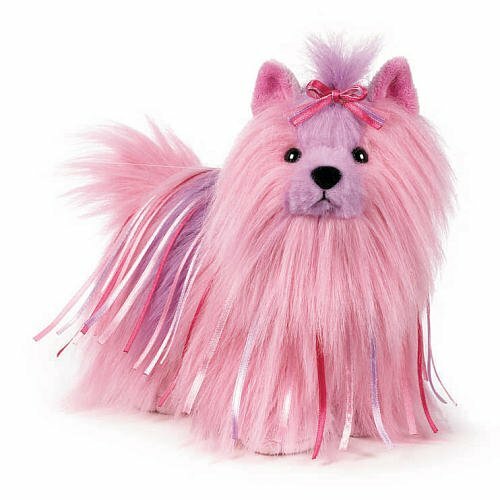 As a Webkinz Toy, this pink Yorkie soft toy can be added in to the Webkinz website where kids from age 6 and upwards can play additional games with their plush pets online. You get to decorate a room for your pets, feed them and care for them and take them to the vets to make them better if they get sick. So it's a fun and educational website as well as being a safe place for kids to play online. A long-haired Yorkshire Terrier is a lot of work - but this one doesn't need any work at all. You don't ever have to brush his hair if you don't want to. If you do want to brush him, make sure you use a soft brush and groom him gently to avoid pulling any hair out. This stuffed Yorkshire Terrier would suit me down to a tee. I'm not into hair styling and grooming and I love dogs as they are without any special hair cuts, colors or fancy dog wear! I like my dogs to be natural and this little guy is just that. He's a cute little scruffball Yorkie. He's made by Melissa and Doug which are toy makers with a great reputation. I've never had any of their plush toys but we certainly have tons of their wooden toy sets: jigsaw puzzles, bead, stamps, farm, castle and more. And we've never been disappointed. Trixie is a soft toy Yorkshire Terrier who is small, soft and cuddly and comes with a cute bow. His bow is a fabric leopard print and chiffon bow which matches his fur. His style looks like a Yorkie puppy dog plush although real Yorkie puppies are black and tan and develop their final coat color over 2-3 years. Yes toy makers are getting better at making realistic plush toys now. I once mistook a cat in the window and thought it was a real one when it dawned on me that it was a bit too still! Thanks for dropping by! These are sooo cute. A couple of them look realistic too.